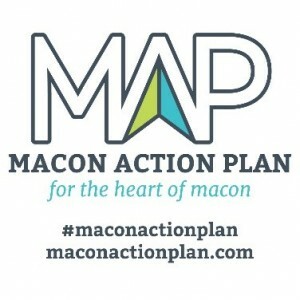 The Macon Action Plan (MAP) is hosting a community reception on Friday, March 6, from 5:00 – 8:00 p.m. at the Cox Capitol Theatre (382 Second Street). The public is invited to learn more about the proposed action strategies for Macon’s Urban Core and see illustrations of what can be possible. Guests are encouraged to come for Happy Hour, review the plan’s recommendations, watch a presentation by the planning team, and, before departing, identify priorities for making our shared vision for the Urban Core become reality. For complete information about the event and this ongoing effort, click here. The Macon Action Plan (MAP) is a comprehensive planning process to envision the future for Downtown and intown neighborhoods and guide change in coming years. All members of the public are invited to help shape this plan for Macon’s urban core. Facilitated by the Macon-Bibb Urban Development Authority, Macon-Bibb County, and their partners, in collaboration with the MAP planning team led by Interface Studio, the plan will incorporate thorough research, community feedback, and expert planning. During the initial input phase, the MAP invited people to an Open House at the Georgia Sports Hall of Fame and complete surveys online to make their voice heard and contribute ideas to the planning process. The community responded in force to MAP’s call to action. More than 130 visitors signed in on Opening Night of the MAP Open House. Guests spoke with neighbors and the planning team, learned about the plan underway, and engaged in eight different activities designed to collect public input that will inform the plan. More than 300 community members in total attended the Open House and participated in the activities during October and November. MAP received more than 550 surveys completed by Urban Core residents and employees. MAP’s interactive website has received 1,200 unique web visitors. 60 community members have participated in 1-on-1 interviews or small group discussions with the MAP’s planning team. MAP’s steering committee of 21 dedicated community leaders tasked with overseeing the planning process have met six times with the planners since the project commenced in Spring 2014. The final plan, made possible with generous funding from The John S. and James L. Knight Foundation and The Peyton Anderson Foundation, is scheduled to be announced in May 2015.